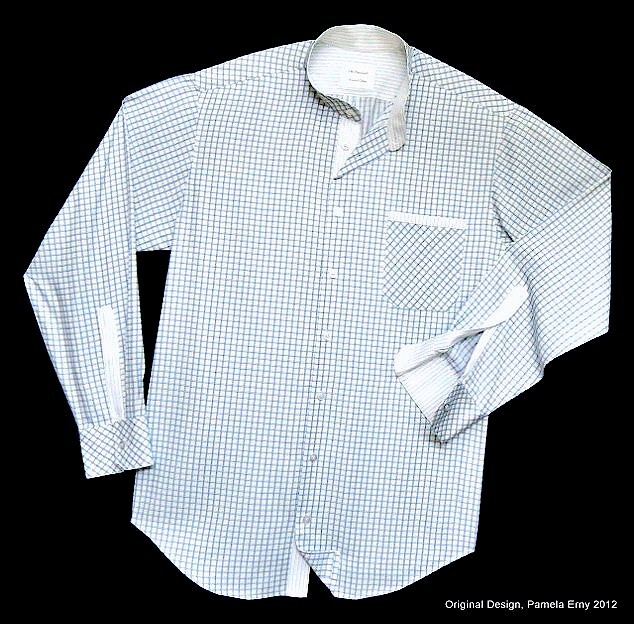 Give me wonderfully fine Swiss Cotton Shirting any day....over shirting fabrics marked "Easy Care". Ladies and gentlemen, it took me HOURS to sew this shirt...a design that should have taken 2 hours max. Why? It's made from "easy-care" aka "no wrinkle" fabric that I was foolish enough to buy during a sale when my regular shirting fabric suppliers were a little low on selection. Can you even see that the contrast fabric is white with blue pinstripes? Probably not, since the fabric has a strange sheen that made photography a challenge no matter what camera settings I used. I hope my client likes it....because the only thing I didn't have to do twice on this shirt was match the checks and fuse the interfacing..those two things were easy. The rest, like creasing folds and getting perfectly even topstitching, was a challenge. And of course, I chose to add bias details, because gee whiz when the fabric is strange to sew with, you might as well frustrate yourself further by placing crucial parts like the collar band and cuffs on bias, right? Ah well..I will soothe myself today by working with some delicious Italian Shirting cotton..that's woven so finely it resists raveling. And so I will stay with "Ravel-resistant" and skip "Wrinkle Resistant" from now on. Beautiful shirt as always, Pam. How I wish I could still get fine Swiss cotton shirting, but alas, no longer! What made it so bad to work with? I saw this fabric as well, but since I don't make shirts passed on it. Regardless of your fabric issues you've turned out a shirt with your usual excellence. For all the years I've been sewing I am still terrible at matching patterns. Can you do a tutorial? Pam, this looks as professional and beautifully sewn as always, despite the pain. I'm sure your client will value it even more knowing you are unlikely to sew this fabric again! Hi Nancy, first of all thank-you very much for the for the compliment. There are bound to be others that will have no problems with these particular shirting fabrics...for whatever reason, I did. The fabric just feels "strange" to me (in my opinion), and I apologize for that terribly vague way of describing it. I have a scrap of it in my hands now, and it feels "slick", and it is "thicker" than the fine shirting I am used to using. Unlike 100% cotton, (which I doubt this is, or I suspect there is some kind of coating on it)...anyway, unlike cotton shirting, even cotton sateen shirting...this was slippery to work with. It wanted to shift both horizontally and vertically with every stitch. It also raveled badly...it does not seem to be of high enough thread count to mitigate raveling. This issue was significant to me because of the felled seams. And when I tried to help stop the raveling with fray check...the edges of the fabric scrap that I tested crinkled and puckered in a weird way. I suppose it boils down to this-- I finished the shirt, but used too much time fiddling with fabric issues. And to a ShirtMaker,(and anyone else who sews for business) time literally is money. It is much faster for me to craft a shirt from Silk Duppioni, Rayon Challis,Silk Broadcloth, and other "not cotton shirting" fabrics...than it was from this fabric. No doubt the next shirt from this fabric would take less time than the first, the 3rd even less, etc. But frankly, I am impatient. I also have a small staff doing some of the more simple operations, and to add the time it would take to even slightly alter our methods among the 3 of us for the sake of a certain type of fabric I am highly unlikely to ever encounter again...is just not profitable. The other 2 remaining lengths that I purchased I have already donated. About matching patterns...well truth be told it's not my favorite thing to do, and I am not an expert by any means. For shirts it is fairly easy, I cut one shirt front right side up and then place it right side down on the fabric making sure everything lines up. I "cheated" on the outer yoke and cut it on bias, as I did with the outer cuffs and band collar this time. I am sure that there are better methods than the ones I use to match patterns to be found in "good" sewing books. Now that I am thinking about it, there *is* a nifty method used by most shirtmakers to match checks where cuff joins sleeve. Perhaps I will do a blog tutorial or include it in the collection of reasonably priced PDF Shirtmaking tutorials I am writing, or submit it as an article to the magazine editor I am working with. Great shirt and I appreciate the difficulty it put you through. There is just nothing sweeter than a very fine cotton. Adding a synthetic, whether a fiber or coating, is like painting a house with cheap paint. It's just not worth it sometimes. This is beautiful, however, because you are such a master at this. Pam, thanks for your thoughts on this. I bought one cut of this fabric but have yet to make it up. I'll know now to choose a relatively simple pattern! I agree that it has an unusual feel to it. A coating seems like a good guess to me. Your shirt does look great though! Pam, I have had the same trouble with wrinkle-free fabrics. The fabric did not ease well and it was hard to get pucker-free seams. Every time I wear it, I have to press it even more carefully than 100% cotton shirts. That taught me to stick with natural fiber shirtings. The shirt is beautiful though! AAAAAAgh. I bought 4 or 5 pieces of it. What have I done? Pajamas? Should I make pajamas? Thank-you for all your nice comments...much appreciated. My client is thrilled with the shirt, so the hassle was worth it! Karla...relax. I am sure it was "just me" with this fabric. Plus there are some fussy details on this shirt that didn't help matters. Two hours, Pam? For a shirt? I am in awe. Also embarrassed, but we'll concentrate on the awe. Difficulties aside, it's so nice. Your shirt designs are always inspirational to me. Thanks for sharing them! OMG - isn't it the truth! I hate, hate, hate sewing with anything other than natural fibers, and not natural fibers that have been "treated". I just finished a contract like this with fabric that was supposed to be silk, but was polyester and took twice as long to make up. Part of it is that we know how crisp and beautiful natural fibers make up. I've never tried sewing with easy care, but I know I prefer, without hesitation, the quality wrinkle resistant shirts that I buy ready-to-wear. I love, love, love them with all my heart. No ironing for my husband, do-da, do-da, no ironing for my husband oh the do-da day..:) From a business perspective your point of view is, well, business. There also may be special methods for working with these fabrics, or they may apply the wrinkle resistant coating after the garment is sewn for RTW. I myself plan on one day trying to work with this fabric to see if I can make some shirt dresses for myself. Not all wrinkle resistant fabric is created equal though, so it might take some testing to find a good source. The shirt you made looks lovely though. It may have been a PITA to work with this fabric, but the final result looks perfect to me! No wonder your client is happy with it! but put that shirt away. . .
Yeesh, it sounds like slinky, which I guess is fair because it feels like slinky. My husband loves the stuff and I will have to use it someday. Forewarned is forearmed.